A cast-in-place concrete anchor assembly for use in slab-on-grad, podium deck, PT Deck and any concrete anchorage design you have. Cast in place concrete anchors are placed into the concrete form area prior to the pour of concrete. 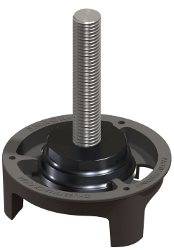 Our ChubbyNut and HeavySet anchor bolt solution provides the lowest effective depth per ACI 318 appendix D requirements. Compared to a nut-plate-nut solution our system can achieves deepest concrete penetration meeting ACI 318 appendix D requirements. And the cost is significationly lower as well. The easiest to install with the absolute best possible attachment solution, the SmackChair. Our SmackChair is the easy anchor base to use and the inspection of our anchor assembly is the easiest in the industry. Color coded SmackChairs easily help identify the anchor bolt size. Whether installing on a podium deck, slab-on-grade or in a concrete wall our SmackChair holds your anchor in place during the pour. Do you have a column to anchor, light post with multiple bolts, or a guardrail to attach to your bridge? Are you installing a holdown system or placing sill bolts all at the base of your framed walls? Then the ChubbySmack combination is the solution that will get you the most from your concrete anchoring condition with the easist installation possible. Call us today! Optimized concrete slab break-out cone. Greatest possible effective depth concrete anchor available. Eliminates pre-fabricated square steel plates. One Solid HeavySet replaces three components (nut-plate-nut). ACI 318 Appendix D calculations available for each ChubbyNut. Available for plain, zinc and hot dipped galvanized anchor rods. Online comparison calculator for converting nut-plate-nut assemblies.